Pre-registered participants may pay to Autism Society Philippines, Banco de Oro, Savings Account # 3980002955. 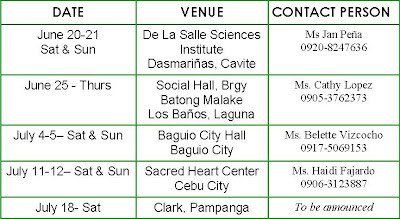 Please fax the deposit slip with the name/s of participant/s to ASP office and bring it on the day of the seminar. On-site registrants will be accepted depending on the availability of slots for June 27. Only pre-registered participants will be accepted on the second day. 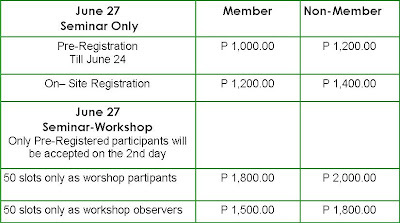 There will only be 150 slots available for the first day and 50 slots on the second day as workshop participants and 50 slots as workshop-observers. No refund will be given to participants who did not show up on the date of the seminar-workshop. Call 926-6941 or 9298447 to register now! 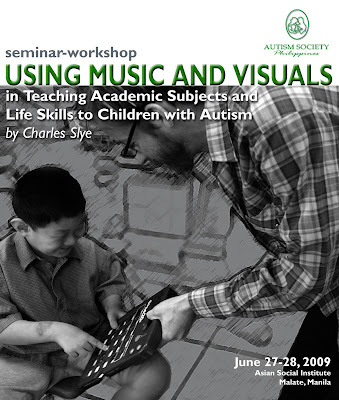 Please e mail me at dionisia_10790@yahoo.com re who will I contact for the CLARK SEMINAR of AUTISM using music and visuals... tnx!! !